3 days Fes Merzouga Marrakech. Visit Ifran winter ski resort and Azrou the Berber village. Explore the world heritage Kasbah Ait ben Haddou . Visit Ouarzazate Atlas film studio . Drive to Dades Valley and stop at Monkey Fingers geological site. Walk in Todra Gorges valley Oasis . 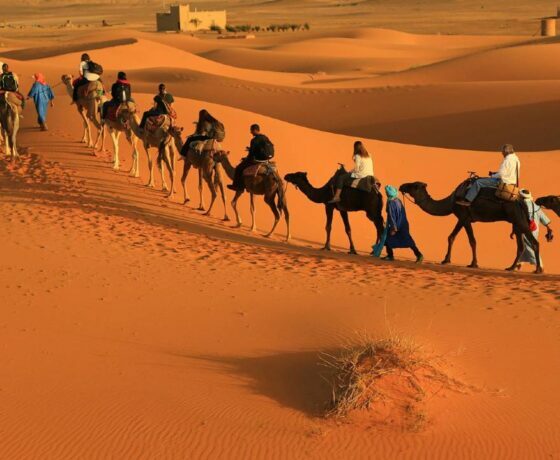 Camel treks in Erg Chebbi dunes the highest sand dunes of Morocco. 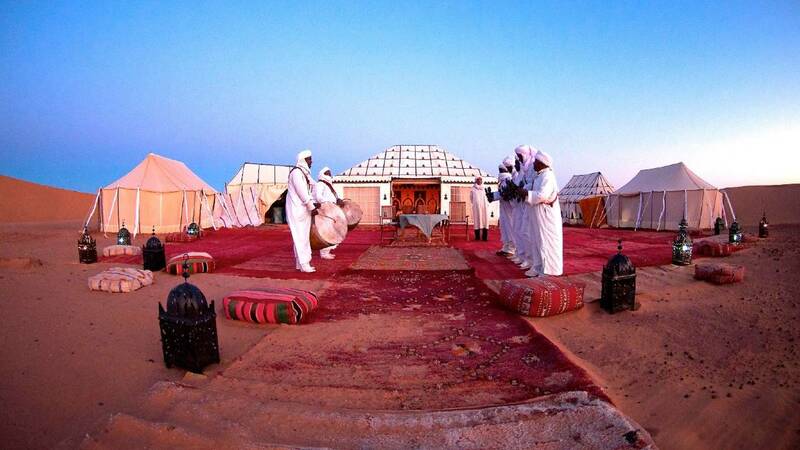 Bonfire and music entertainment at the desert camp. Modern air conditioned Minibus from Fes to Marrakech. Travelling from Fes in the north of Morocco to the central city of Marrakech is an ideal way of seeing two of the imperial cities of this mystical kingdom. We will get an early start and pick up from your hotel before starting out on our first stage of an adventure of a lifetime you’ll never forget. 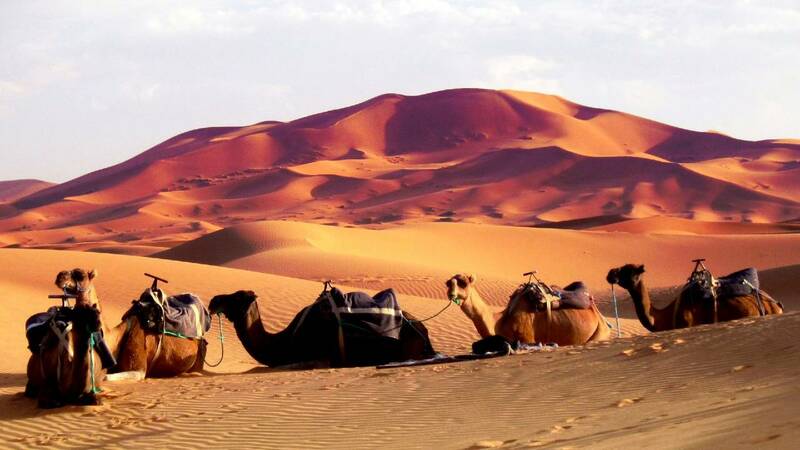 The Fes to Marrakech Desert Tour will take us three days (two nights) to complete and the memories and photographs you’ll bring back with you will last a lifetime. You will cross the Middle Atlas Mountains, witness ethereal cedar forests, fascinate at the cheeky little Barbary apes and experience unbridled views across the Ziz Valley and its gaping gorge. 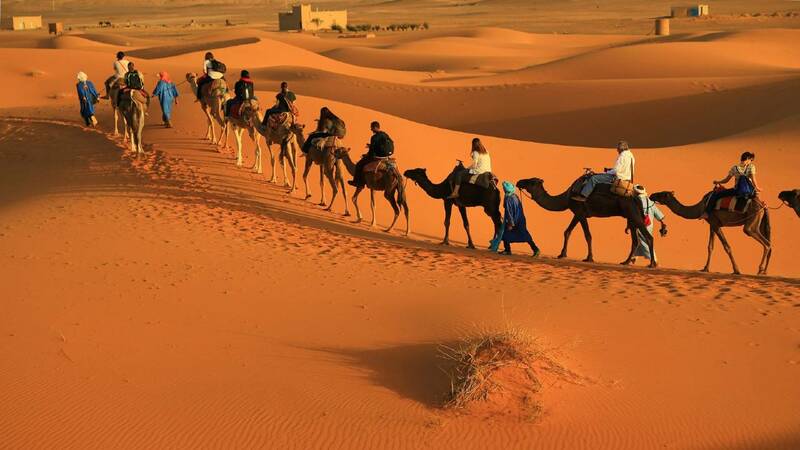 You will even have the opportunity to mount the proverbial caravan of the desert when you climb on a camel and trek like a true desert nomad to Erg Chebbi complete with its sand dunes. All camel tours and trek will be accompanied by an experienced local guide. The desert guides are highly experienced with the camels, so you will be in safe hands on your journey atop this local desert mammal. Watching the sunsets and the sun rising over the deserts is an experience that will live long in the memory – but seeing the dark skies at night allows the desert camper to witness ten times as many distant sky objects as you might in any city. We will dine under the stars too. 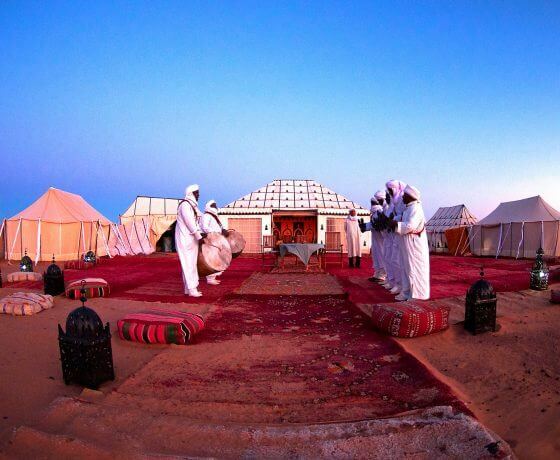 Sleeping takes place under a nomad tent cover and gentle Moroccan drums add to the ambience of the desert night. Traverse the high Atlas Mountain range down into Marrakech. Pick up from your hotel takes place very early allowing us the full day ahead to get to our first stop at Ifrane. This region is known as Moroccan’s own Little Switzerland. You’ll see the similarities in the beautiful valleys and mountains here. At Azrou, our next stop, you will see the tame little monkeys. They will jump through the branches of the cedar forests effortlessly and you will get a golden opportunity to take a photo or three as these little apes are definitely not camera-shy! Next, we shall stop for lunch in Midelt before crossing the route through Tizi n Talghamt Pass. Here we will reach Errachidea where you’ll see an area of outstanding beauty at the Ziz Valley Gorge. 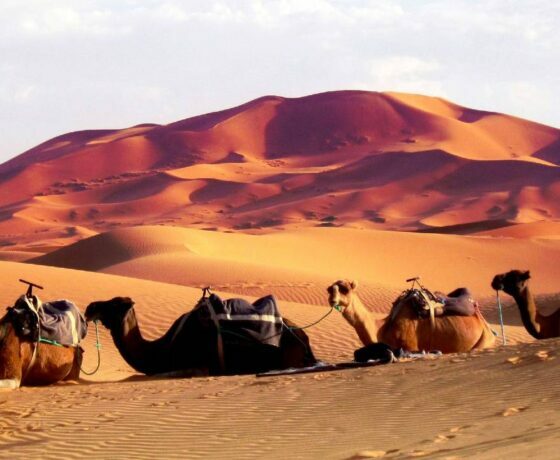 The drive will continue through the dunes of Erg Chebbi before stopping off at our hotel, where you may freshen up in preparation for a camel trek through the Merzouga Dunes. Your dromedary will transport you through the evening desert to a nomad tent where you will camp down for the night under the stars and dine. We will wake early so as to witness the sunrise on top of a desert dune. This is definitely something you will want to do someday. On day two of your Fes to Marrakech Desert Tour you’ll enjoy a delicious breakfast before continuing your Moroccan adventure across the desert. After a refresh stop at a hotel, we continue the journey onto Tineghir then Erfoud. Our journey then moves onto Tinejdad as we head west into the southern half of Morocco. Walking along the banks of the Todra River you will see many waterfalls, beauty spots and the odd Berber village before we take up our drive onto the awesome Boumalne Dades Valley. There will be ample opportunity to hike through the Todra Gorge, taking in as much photography as your camera can muster and enjoying lunch along the way. 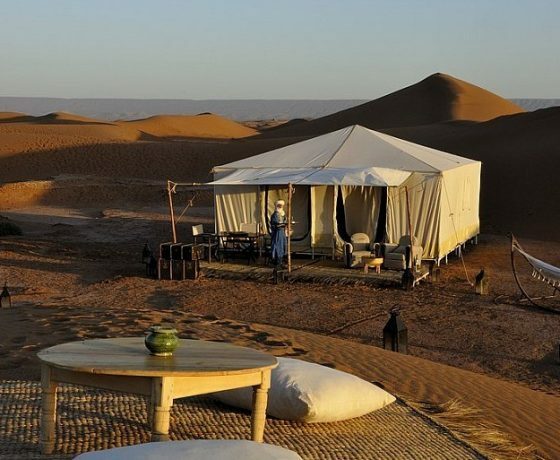 A restful dinner, shower and overnight stay in a hotel will complete your final night on the Fes to Marrakech Desert Tour, allowing you enough rest before the final day’s push to Marrakech. On this day the Fes to Marrakech desert tour winds up but not without another fun-filled, awe-inspiring adventure as we close in on this ancient city. You will witness the legendary city of Ouarzazate, which lies just east of the High Atlas mountain range. The city boasts a 19th century palace, a massive Kasbah and a rugged landscape that has been used in many feature films like Gladiator, The Mummy and Game of Thrones, to name but a few. Lunch then takes place in the Kasbah at Ait Benhaddou and the afternoon highlight has to be the drive through the High Atlas Mountains. The Tizi N’Tichka Pass is particular spectacular as it ranges up to 7,500 feet above sea level. After going through this spectacular mountain range your adventure culminates into a 65-mile drive to Marrakech. 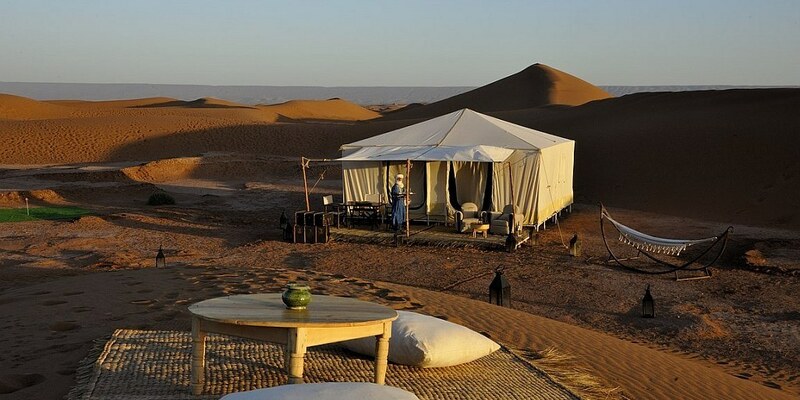 This signifies the end of your desert tour adventure but heralds the beginning of an experience to explore Marrakech.